Flying bicycles? Where I've seen that before? tss, Spike should've handed him 10 Euros -All hail the EMPEROR of all mortals! Oh no! He gets paid in pennies!? Hey, that is a good tip! Way to go Spike! You can always go auto-pilot! Okay then. Thanks for trying to keep it up! We appreciate and love it all! So Mach isn't a bad guy after all? Wow... I never knew Hell had nice guys too. UNLESS... he's just faking it again and is waiting for the right opportunity to attack them! Oh yeah, I can see it now! Those bikes are gonna malfunction or something! That's what his plan was all along! ...and now Mach must save them because he's in debt! You know, you don't have to be "evil" to go hell. He could had been greedy or promiscuous when he was alive. Or he could have sold his soul for something. Off on the scaredy bikes we go, off to danger, intrigue, and fun! I'm pretty sure that these "All hellspawns are poor." strips may be offensive to them. Maybe we should ban these last two. I don't know, Gren. If he hadn't been so evil, he would have been sent to Purgatory. Wait.... 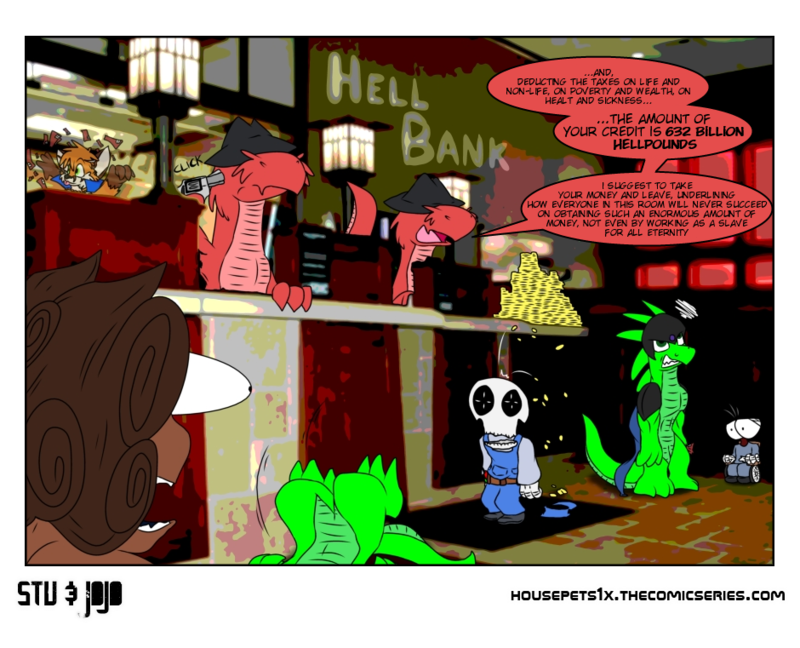 Does Purgatory even exist in Housepets!? Also, That theme song thing? Pfft, I think that all the The Lonely Island songs, played in succession over and over, would be much more interesting and enjoyable to listen to in this chapter! Last edited by _Stu_ on Fri Jul 12, 2013 2:17 am, edited 1 time in total. Y'know, suicide in hell is just a more violent and stronger representation of disagreement. If you're a mortal, just move your head from left to right and reverse. Yup, that way. Last edited by _Stu_ on Sat Jul 13, 2013 4:11 am, edited 1 time in total. Yay. Karishad for the win! today's strip is SO full of win! Go, Mach! Now you can buy Hell with change to spare! ...I don't understand what's going on. But I like it! What's Karishad doing in the background? This is probably the best strip in the arc! Mach should buy hell for himself. Now everyone will be thinking, "Just great! I could quit the job, if only I had been kind to those guys!" "Milliardi"? Let it be known that "A billion" in English, instead of meaning "A million millions", merely means "A thousand million", so you can imagine that when I heard that Bill Gates had over 9 "billion" dollars, my mind was in the same state as Mach, over there! Dat fox is stealing all the bacon, and mister lion-man and his bug-eyes are back! Hurray! Where is his boat, though? Oh Kari, Hell is your playground now, eh? What have they done to that poor soul? They enriched it, of course! Last edited by Karl on Sat Jul 13, 2013 8:15 am, edited 1 time in total. Primo died a little before Christmas right? That means this story line has been going nonstop for almost 8 MONTHS. I think the only show that's beaten that is lost. I just realized something, too. When I saw this strip for the first time and looked at Karishad doing something in the background, I thought he's juggling bacon. Oh please, you think that? That's Rich!!! There are thousands of TV shows who have done that. I think he is tossing it as if it were golden coins from a long lost treasure he found. I wonder if that bank also serves Chinese food. Uh yeah, that's a collateral of the experiment. We're trying to create a saga into the saga. That's why this chapter is going to be long, because it's also going to be (hopefully) more interesting and good than the other chapters. So far, it's the longest (73 pages) and we're not even at the half of it. But right now feels like the best chapter we've ever made to me. At this rate the arc should be done by Easter. Oh Peanut... I wonder what you did this time. That many?! But you're right about it being the best so far.